If you’re like most people, the cluttered mess in your garage completely thwarts your ability to use the space productively. The garage has the potential to be one of your favorite rooms in the house, but it needs a little TLC first. 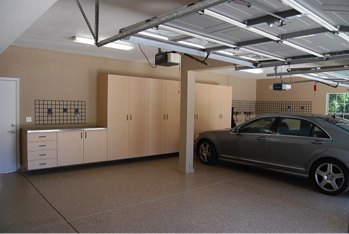 Use these tips to take back your garage! If you have a toolbox and work bench, the garage is the best place to put them. However, you must make the effort to keep your work area clean and organized. To make your job easier, attach a wall pegboard above your work bench or bring in a wheeled tool cabinet. A sealed laminate or plastic work surface is best for stain and dent resistance and will look like new for years to come. How do you currently store gardening supplies? If equipment is stacked in the corner and gets knocked over every time you try to grab something, remedy the situation with a garage wall storage system. Install individual hooks for rakes, shovels and hoes. Attach a wall rack and hang trowels, gardening gloves, small planters and seed packages so they’re up off the floor. You can easily change the location of hooks when you attach a wall rack, allowing for customization later down the road. If you find your wall space becoming cramped with tools and gardening supplies, turn to overhead storage for lesser-used items. Heavy duty racks mounted to the ceiling help you make the most of your garage storage space. Overhead storage is ideal for seasonal items you only use once a year, such as camping gear or holiday decorations. Spare tires and luggage can also be stored up high. Choose a standard stationary system or storage racks you can raise and lower on demand. Some movable overhead storage options use pulleys while others have a motor to raise and lower the rack with the touch of a button. Not everything can hang from a hook or be stored overhead. For items such as cleaning supplies, backpacks, sporting equipment and food storage, garage cabinets are the best solution. Choose from open-air or closed cabinets based on your storage preferences. Whether you’re hoping to organize wall-mounted shelves or store items on overhead racks, large plastic storage bins are the best option. Group like items together and label the bins to ease the task of finding what you’re looking for. Clear bins are especially convenient for organized storage. If you’re ready to take back your garage, please schedule a free on-site design consultation with the experts from Boston Garage today!